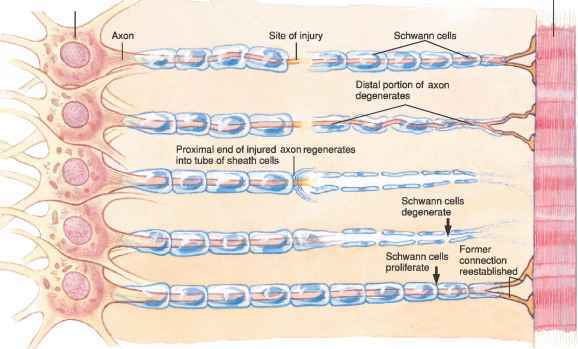 Neurons in the brain or spinal cord synthesize neuropeptides. These peptides act as neurotransmitters or as neuromodulators—substances that alter a neuron's response to a neurotransmitter or block the release of a neurotransmitter. Among the neuropeptides are the enkephalins that occur throughout the brain and spinal cord. Each enkephalin molecule is a chain of five amino acids. Synthesis of enkephalins increases during periods of painful stress, and they bind to the same receptors in the brain (opiate receptors) as the narcotic morphine. 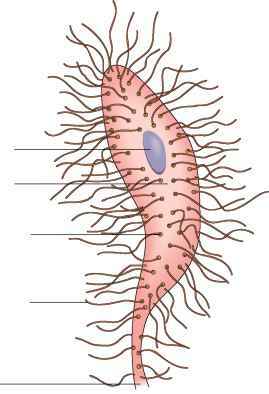 Enkephalins relieve pain sensations, and probably have other functions as well. Another morphinelike peptide, called beta endorphin, is found in the brain and cerebrospinal fluid. It acts longer than enkephalins and is a much more potent pain reliever (Clinical Application 10.4). 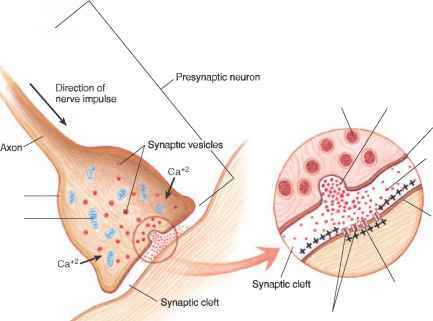 (a) When a nerve impulse reaches the synaptic knob at the end of an axon, (b) synaptic vesicles release a neurotransmitter substance that diffuses across the synaptic cleft. 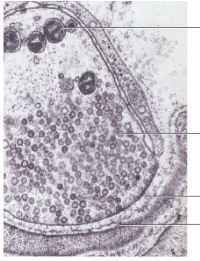 (c) A transmission electron micrograph of a synaptic knob filled with synaptic vesicles (37,500x). The synaptic knobs of many axons may communicate with the cell body of a neuron. the nervous system. It functions as a neurotransmitter (or perhaps as a neuromodulator) in the neurons that transmit pain impulses into the spinal cord and on to the brain. Enkephalins and endorphins may relieve pain by inhibiting the release of substance P from pain-transmitting neurons.